Did you know that the concept of teeth whitening has been around since ancient times? Since then, however, teeth whitening methods have made significant advancements in terms of both safety and effectiveness. The professional teeth whitening treatment we use today didn’t begin until the late 1980’s. Ancient Egyptians – As a status symbol, they were known for mixing ground pumice with white vinegar and rubbing it on their teeth with a frayed stick to whiten them. Romans –This people group realized that the ammonia in human urine had a whitening effect on their teeth! 17th century Renaissance – Barbers were the ones that performed most dental work. They took an aggressive approach and used a file to “rough up” the tooth surface. Next, they’d apply nitric acid to whiten them. Unfortunately, it was soon discovered that this purposeful attempt to damage the enamel also greatly increased the chance of tooth decay. 19th century – Thankfully, dentists took on the task of treating the teeth in this time period. As they experimented with gum disease therapy using hydrogen peroxide, they discovered that this solution also had a lightening effect on the teeth. 1960’s – Experiments and studies with hydrogen peroxide as a teeth whitening agent continued. Dentists found that soaking extracted teeth in peroxide overnight could lighten the teeth by several shades! 1989 – First real tooth bleaching began. A whitening gel (carbamide peroxide) known as Opalescence was first patented and tooth bleaching trays were custom fabricated to fit the exact mold of the patient’s teeth. Patients were instructed to sleep with the whitening mouth guards for 10-14 nights to produce desired teeth whitening results. This launched several new whitening systems used by dentists nationwide. Today, there are countless ways to whiten your teeth, especially if you count the products on the grocery store shelves. For the most proven and effective teeth whitening, it is always best to go to your dentist. Some over-the-counter whitening products can be too abrasive and do more harm than good. 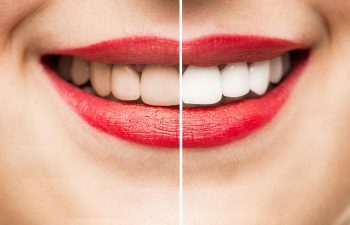 At Gold Hill Dentistry, we proudly offer the latest whitening systems that can erase stubborn staining and help you gain the bright, attractive smile you deserve! Keep in mind that teeth whitening is not recommended for kids under 14.